Nothing terribly shocking here, up to 8x burn on single layer DVD+Rs, 6x on dual layer discs, and 24x on CD-Rs, should you ever have a need for that. Noteworthy here is Linux support, and as we’ll see, it’s more than just “works with standard drivers”. First and foremost, this drive supports every flavor of writable DVD known to man. Secondly, it operates solely under USB bus power. As such, you’ll want to plug it either directly into your computer, or into a self-powered hub for best performance. As you might expect, it supports those little novelty 8cm disks as well as the regular 12cm variety. 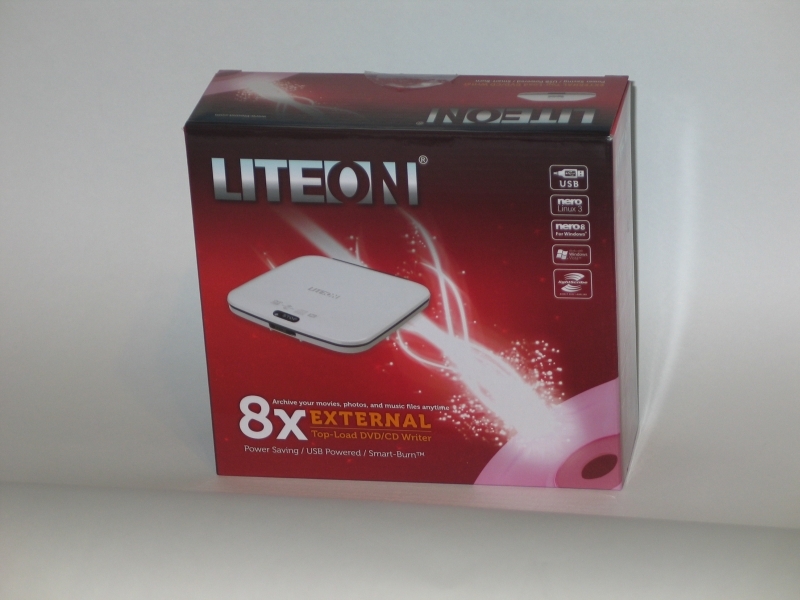 Since a fair number of smallish gadgets come with drivers loaded on 8cm disks, this can come in handy even if you never burn to that format. 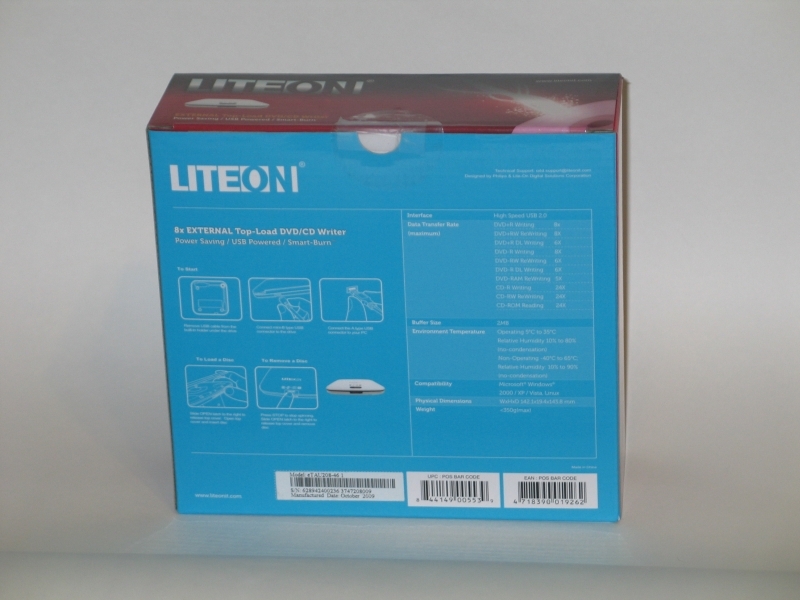 The packaging is fairly attractive here, which is unusual for Lite-On. The text does a fair job of highlighting the important data—8x, external, USB powered, comes with Nero software—without looking cluttered. The back lays out the steps you’ll need to get it running fairly simply: plug it in, load a disk, hit stop when you’re done. 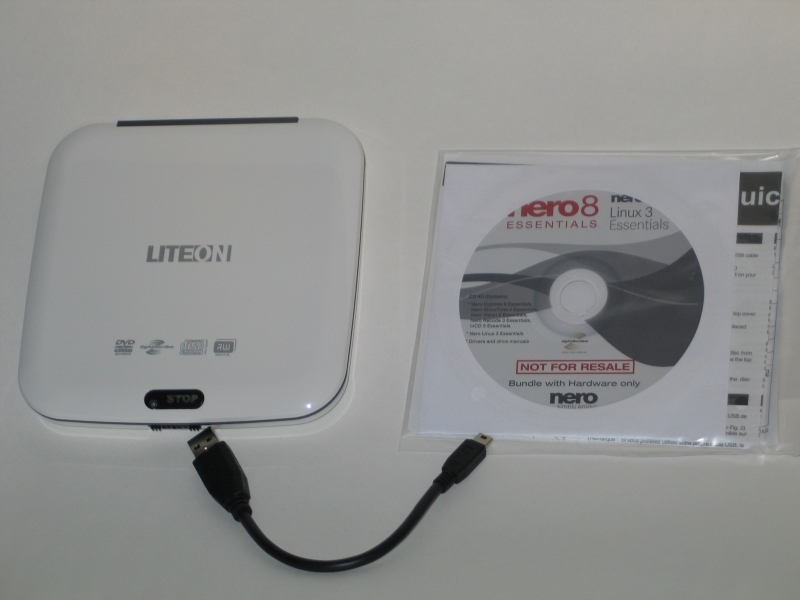 Once out of its cardboard cradle, the drive and its accessories are fairly simple: short USB cable for both data and power, user manual and disk with complementary Nero software for Windows and Linux. 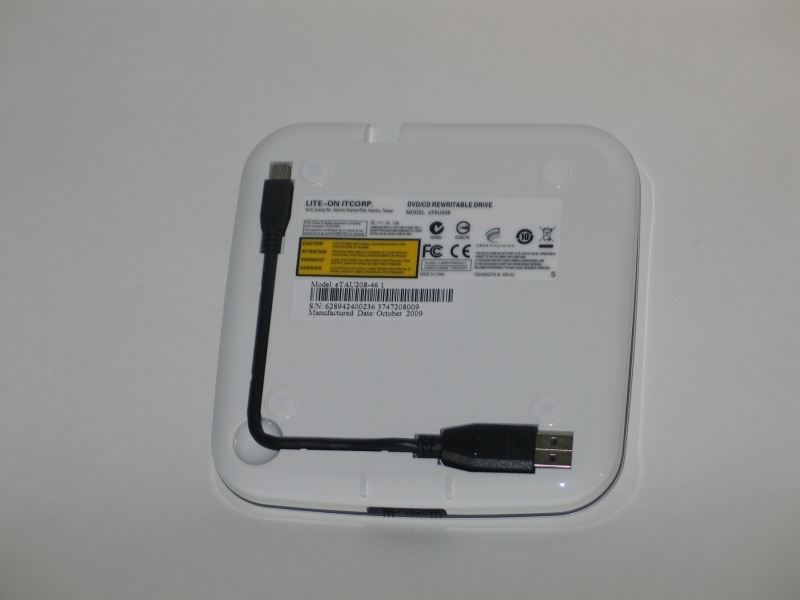 The underside of the drive deserves some mention: it’s got an inbuilt groove for storing the data cable when not in use. This makes the drive quite handy for travel, as it becomes more or less self-contained with little effort. For testing purposes, I turned to the Nero bundle included with the drive, which comes with a useful little tool called Nero DiscSpeed. Not only does it give you a fairly comprehensive look at the drive itself, it also includes facility for testing the quality of the media you’re using, as well as the integrity of the data on any disks you’ve already burnt. Transfer performance was solid, with a nice steady curve from 3.40x at the inside spindle to 8.26x at the outer edge. This drive operates in CAV mode, which aims to keep the data track moving past the laser at the same speed throughout the disc. In our test, which used a variety of files ranging from a few KB to a few hundred MB, the throughput averaged about 17 MB/sec, which puts it ahead of many cheap flash drives. Seek times never ventured above 260ms, which is impressive for a drive running on so little power. Total time elapsed for a full copy of all 4.3GB: 00:09:41. For the writing stage of the test, we chose to burn that same assortment of files, letting the drive determine the write strategy automatically. The result was an average rate of 5.43x, with the full 4.38GB write taking 00:13:03 to complete. Obviously this will vary with the quality of the media, but this drive seems well equipped to handle the task. Spam, gotta love it. BTW your information is completely wrong. Get your facts straight before you decide to comment.